This weekend is filled with festive holiday celebrations throughout the land. And by the land, I mean Greater Lansing. Lansing and East Lansing are fortunate to have a number of awesome quaint and so typically Midwest surrounding communities. Sometimes I feel that that allow you to step back in time to a quieter, sweeter, more innocent time. So come along with me on a sentimental journey to when the kids were young and life was simpler. 18th Annual Holiday Light Parade Downtown Williamston Saturday, December 6 Times: 6 pm Admission: Free Contact: 517-655-1549 http://www.williamston.org/ The parade steps off at 6 pm, with illuminated floats and vehicles, marching band, animals, and more! After the parade, Santa and Mrs. Claus will help with the lighting of the tree in front of City Hall, 161 East Grand River in downtown. The kids will want to bring their lists and visit with Santa immediately after the tree lighting. They will be in Kellers Plaza, 107 South Putnam. There are extended holiday shopping hours with many businesses offering popcorn, hot cocoa, hot cider, etc. Come early and browse around town! Grand Ledge Night Lights Christmas Parade Friday, December 5 Time: 7 pm Admission: Free Contact: http://www.grandledgechamber.com/ Join the community for this spectacular parade of lights starting on the north end of Bridge St. and travelling south across the bridge with music and Santa & Mrs. Claus aboard a Fire Truck. Visit with Santa after the parade at the Sun Theater and watch the free movie, "Shrek The Halls." 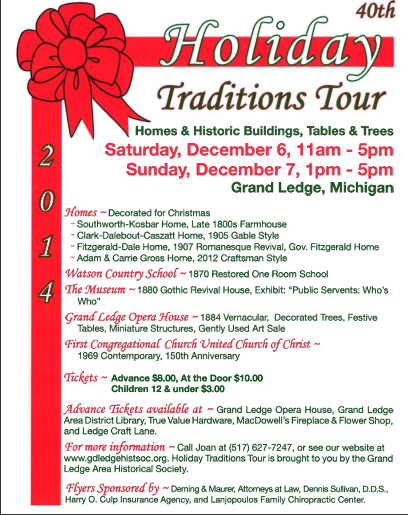 Holiday Homes and Traditions Tour-Grand Ledge Saturday and Sunday, December 6-7 Times: Saturday: 11 am-5 pm, Sunday 1-5 pm. Admission: Tickets: $8 advance $10 at the door $3 children 12 and under Contact: www.gdLedgeHistSoc.org 40th Annual Holiday Traditions Tour: Homes, Historic Buildings and Tables. This year features beautifully decorated homes, Watson Country School, The Museum, The Opera House, and First Congregational United Church of Christ. Meet SANTA at the Gazebo in the Opera House Garden on Saturday 1 - 2 pm. Bring your camera for a picture with SANTA. 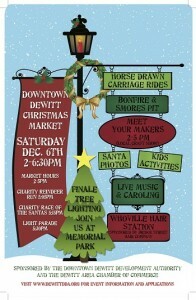 Annual Christmas Market Downtown DeWitt Saturday, December 6 Times: 2-6:30 pm Contact: http://www.dewittdda.org/ Horsedrawn carriage rides, bon fire & smores pit, Santa photos and kids activities, light parade at 5:30 and the finale tree lighting at memorial park. 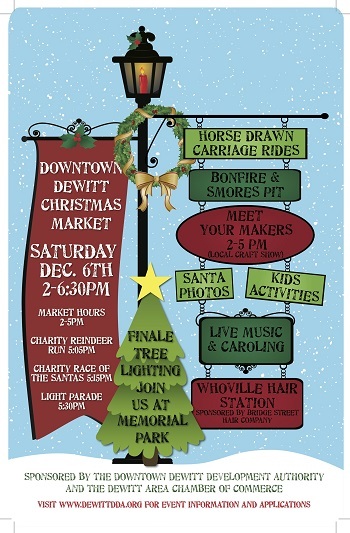 Also occurring this Saturday areEast Lansings Winter Glow from 3-6 pm and Old Town Dickens Village noon-5 pm.